The Outdoor Learning and Retreat Center offers four amazing venues to serve K-12 school groups, university and church programs, scout groups, and those looking to host a meeting or retreat. Each of our four venues has an atmosphere all its own, and we can help match you with the space that will suit you best. While we specialize in K-12 overnight programs on our two camp facilities, our two nearby meeting and retreat centers are designed with professional clients who are seeking a full service meeting and retreat venue with all the amenities to make their team both comfortable and productive in mind. Our company developed organically from our experience as one of Virginia’s premier summer camp programs. From early June through late August, our Horizons facility houses happy campers from all around the world, but in the spring and fall camp got a little too quiet for our liking. So, we broadened our scope to allow us to operate through multiple seasons. We began offering quality Outdoors Adventures, Team Dynamics and Environmental Education programming to schools, scouts and other youth in the surrounding Virginia, DC, and Maryland area. Word spread about our exciting programs, skilled instructors, and our beautiful facilities, and our outdoor programming client base grew. Now, we host groups from all walks of life, both youth and adult. Eventually, we had so much going on that we decided it was time to expand. We restored an iconic farm house just next door and created our Mountain Valley Meeting and Retreat Center to serve our more professional groups and get togethers. About that time, we also purchased a property a little closer to Harrisonburg that is now home to our Valley Pike Meeting and Retreat Center which is a versatile space for many of our business groups. Then, when our K-12 programs started to get even more popular, we partnered with the Sheridan School of Washington D.C. to manage their summer camp and retreat property in Luray, Virginia which we now refer to as our Mountain Campus. 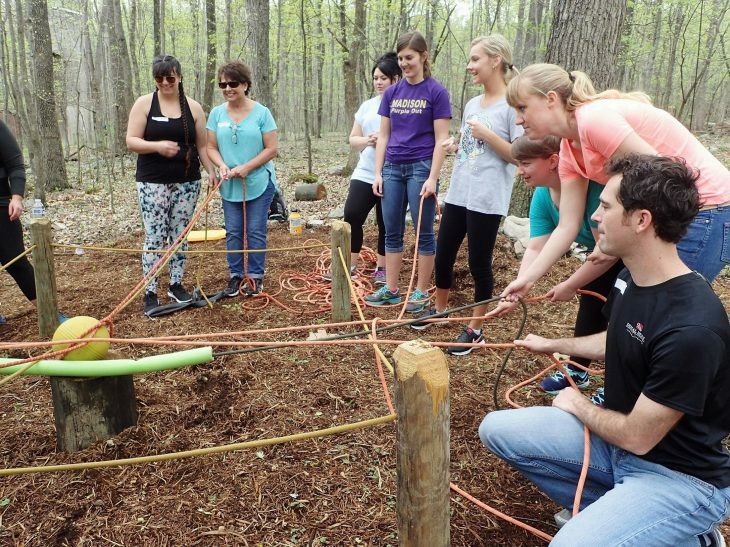 We design powerful outdoor educational programs, create safe and memorable events, and provide the folks that stay with us an opportunity to enjoy the Shenandoah Valley in a number of ways. With a year round team of professional staff to handle all the logistics and planning, we are setup to support or create whatever you can dream up.